As technology improves within the automotive industry, a growing number of features once reserved for the high-end luxury vehicles market have become available for commercial fleet vehicles. Chief among those is the backup camera, which gives drivers improved safety and helps prevent costly accidents. You may feel that your interior and exterior review mirrors are adequate enough, but your vision is limited while using your mirrors due to the blind spots your vehicle creates. A backup camera system not only provides you with added convenience, but it also provides you with full coverage while reversing out of driveways, alley ways or tight parking spots preventing serious accidents. Image Sensor Technology: There are two image sensors available on the market today. They are Charge-Coupled Device (CCD) and Complementary Metal Oxide Semiconductor (CMOS). CCD provides the best picture, while CMOS provides the best functionality. View Angle: The wider the camera view angle, the more coverage you will receive while backing up. Weather-Proof: How will the product stand up against Mother Nature? 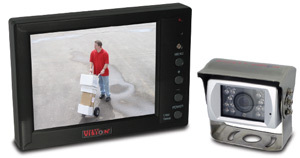 Is the backup camera placed in a housing that will withstand the elements of time? You do not want to replace your backup camera system every year – That can get costly. Electric Voltage Rating: Will the backup camera system work with your vehicle? Most backup camera systems should be able to support a fluctuation in voltage, but, it’s always a good idea to consult your vehicles manual in addition to the product instructions. Audio Capability: Some backup camera systems have audio capabilities and some do not. If you are looking for one that has audio capability, be sure to examine the cameras casing to see how the microphone is protected and whether or not it is water-proofed. Wired / Wireless: When deciding between a wired or wireless based backup camera system, you need to take into consideration the size of your vehicle and any other electronics on board. Larger commercial vehicles typically have more electronics on board that could potentially cause signal interference with wireless based backup camera system models. Whether you prefer a wired or wireless based backup camera system, you need to choose the option that is best suited to your driving needs. Ryder Fleet Products carries multiple backup camera systems from Velvac and Safety Vision that can help eliminate those pesky blind spots while giving you piece of mind while driving. This entry was posted in Featured Manufacturer, Safety Topics by ryderfleetproducts. Bookmark the permalink.